Mode of occurrence: Small irregular nodules or pebbles. Cortex: Can be pale tan, worn and thin, smooth to moderately rough, or cream-coloured, smooth and partially rolled with traces of impact; transition always sharp. Colour: Light to dark olive grey (5Y 4.4/2 to 3.5/2), to light brownish grey (2.5Y 6.5/2). Pattern: Flecked/spotted (unreplaced matrix and concentrations of micritized elements). Appearance: Homogeneous material with a medium lustre, semi-opaque to subtranslucent in thin flakes, smooth and medium to fine-grained. Grains: 10 to 15 %, very small pale rounded elements (40-80 µ), skeletal grains with high sphericity contained between 150 and 300 µ. Grain composition: Fewer thin-walled sponge spicules than in CN2a (occasionally preserved lattice), benthic foraminifera (Nodosarianidea, a complete 3 mm long Nodosaria sp., Lenticulinea), discrete Nodosaria chambers (200-250 µ), numerous globose planktonic foraminifera (e.g. Hedbergella planispira), rare small biserial foraminifera (Heterohelicidae), pollen fragments, a tube-shaped organism. Co-ordinate precision: As with most sites in this section on the Bugey, the French Lambert-values were taken off a large-scale topographical map and the geographical coordinates were calculated directly by transforming those values on WGS84. The precision of both are within 50 metres. Other types of flint: The residual loams on this location contain also CN1a and CN1b flint. Other types of flint: Besides the CN2b material, flints of the CN4c and CN5 type (both of similar age) might be found here. Geographical description: The source is located just east of the small road which connects the hamlet of Solomiat with the D 979, the main road in the northern part of the Bugey, linking Bourg-en-Bresse with Bellegarde-sur-Valserine. Solomiat lies approx. 10 kilometres as the crow flies WNW of Nantua, on a terrace on left bank of the river Ain, some 360 metres above the bottom of the narrow valley. Co-ordinate precision: As usual with the sites from the Bugey, the French Lambert-values were taken off a large-scale topographical map and the geographical coordinates were calculated directly by transforming those values on WGS84. The precision of both are within approx. 50 metres. Geology: The flint is to be found in residual loams left after the decalcification of Late Cretaceous (Senonian) limestones, unit Rs on the geological map. 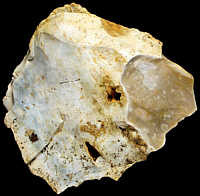 Other types of flint: Apart from the CN2b-type, also two other flints of Senonian age can be found here, namely CN1a and CN4c. Geographical description: The material was collected on a south-facing slope overlooking the eastern "outskirts" of Poncin, 20 kilometres SE of Bourg-en-Bresse. Geology: The site is located on fluvio-glacial deposits from the Würm I and II stages (units agl a-b on the geological map), in contact with Aquitanian sediments (Early Miocene, unit ml). This results in a mix of Upper Cretaceous and Cenozoic flints being present at this site. The CN2b type can be dated to the Campanian. 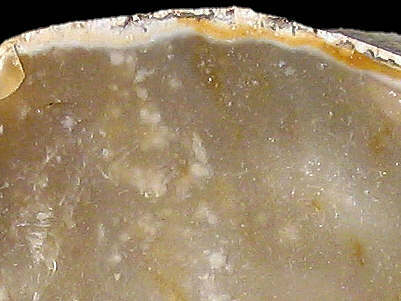 Other types of flint: As so often on secondary sites, quite a lot of other types of flint can be found here, mostly of Late Cretaceous age: CN4a, CN4b, CN4c, as well as the Cenozoic "silex lacustre" of the T1 type. Synonyms: Sampling site Bugey 63 after Féblot-Augustins. Geographical description: The sample was collected at the foot of the hillside north of the road that connects Poncin with Leymiat, some 500 metres northwest of the latter village. Co-ordinate precision: The coordinates given were taken from a detailed topographic map, and are within approx. 50 metres of the actual spot. 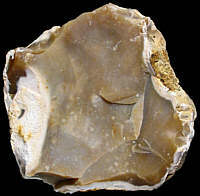 Geology: Although the flint itself dates to the Late Cretaceous, it now lies in a secondary position, embedded in fluvio-glacial deposits from the Würm I and II stadials (unit "agl a-b" on the geological map of the region). Other types of flint: Besides CN2b flint, the CN2a variety can be found here too.